EVER since the day that Nasr-ed-Din Hodja's arrow had surprised Tamerlane's soldiers by piercing the bull's-eye, he had kept a bow and arrow about the house, just in case it were needed. It made him feel safe to know that he was ready to defend his home and his wife no matter what threatened. One night he was wakened by sounds in his yard. He lay in bed, trying to figure what it could be that went swishing and flapping under his window. Without waking his sleeping wife, he crept to the window, picking up his bow and arrow as he went. It was well to be prepared for anything. It was a night when the moon was darting in and out among the clouds. When he first looked out of the window, his yard was in total blackness, but he could still hear a sound as of wind blowing through a thief's garments. It seemed to come from the corner of the yard under the old apricot tree, but not a thing could he see in the darkness. Suddenly from behind a cloud the moon popped out and the whole yard sprang into view. There was the rascal under the old apricot tree. The Hodja could see his coat swaying back and forth as he stood there, undecided where to start his thievery. Now was the time for Nasr-ed-Din Hodja to show himself a real hero. He looked back at the sleeping Fatima and whispered, "Whatever fate may decree, your husband will protect you! Sleep on unafraid! You are perfectly safe!" He threw the window open wide, hoping the noise would send the thief running, but the moonlight showed the robed figure still standing uncertainly beneath the old apricot tree. "Go away, thief!" shouted the Hodja. He waited. The figure under the apricot tree did not move. "Go away, I say, or I will shoot you with my bow and arrow." This threat should have terrified the intruder. He did seem to tremble a little, but the brazen fellow held his ground. "I am fitting an arrow to the bow," called the Hodja. Still the figure stood there. Fatima roused in her bed and mumbled sleepily. "I am pulling back the bowstring," warned the Hodja, who wanted to give the poor fellow every chance to escape. There stood the Hodja in the window, with the bowstring taut and the arrow in place. There stood the stubborn fellow under the apricot tree, ignoring every threat. Shooting a man was the last thing in the world the Hodja would care to do, but a threat was a threat and must be carried out. Suddenly the Hodja remembered that the only time he had hit the bull's-eye was the time he did not aim. This time he would aim carefully, and his arrow would hurt no one. He would be keeping his threat and would, without a doubt, frighten the man out of the yard. "I shoot!" shouted the Hodja. He let the arrow fly. Just then the moon hid behind another cloud and the yard was in blackness again. Strain his eyes as he would, not a thing could he see in the corner under the old apricot tree. The thief was probably over the wall and running as fast as he could. Feeling he had carried himself as a man should, the Hodja told the whole story, with gestures, to Fatima who was now three-quarters awake. Then he snuggled under his quilt and slept the sleep of the brave. So sound was his sleep that he found Fatima was up and out-of-doors when he awoke in the morning. In fact, she had been up long enough to work herself into quite a rage. What could be the matter? "Hodja Effendi! Hodja Effendi! Come here!" she called under his window. There was something in Fatima's voice which made the Hodja wish he were still asleep. What could he have done to displease her so? Well, he might as well face it now as later. He stuck his head out of the window with, "What is it, my dear?" 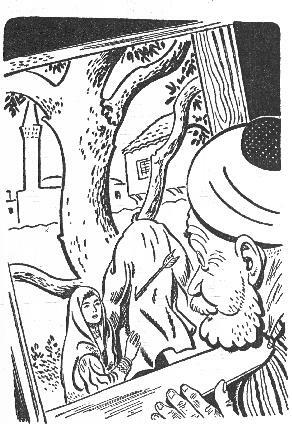 Under his window he saw Fatima standing, holding up his own best coat which she had washed the day before and hung to dry under the old apricot tree. In the back of the best coat stuck Nasr-ed-Din Hodja's arrow. "You and your archery!" snorted Fatima, as she looked at the two jagged holes she would have to patch. Her scorn would have completely withered anyone less cheerful than Nasr-ed-Din Hodja. "Oh, Allah be praised! Allah be praised!" sang the Hodja. "Why praise Allah when you ruin your coat?" "Oh, Fatima, don't you see that my life was saved as by a miracle?" cried the Hodja. "See where that arrow pierced the coat! Just think! If I had been inside the coat, the arrow would have gone clear through my stomach. Oh, Allah be praised! Allah be praised!"